Like so many other products, the early history of office staplers is not clear-cut. There are overlapping patents, differing technological solutions, conflicting information, lawsuits, and debates about what type of dates should be used as the “start” date for something. In general though, it can be said that the nascent phase for office staplers started around the 1870’s. The Novelty Paper Fastener was one of the earliest staplers made specifically for fastening papers. It was manufactured by the Philadelphia Novelty Manufacturing Company which was based in Philadelphia, PA and they eventually also had offices in New York City. The Philadelphia Novelty Manufacturing Company was established in 1874 and incorporated in February, 1885. The Novelty Paper Fastener consisted of two parts; one was a horizontal spring loaded paper clip made of cast iron that had a purpose-built holder at the clip end. 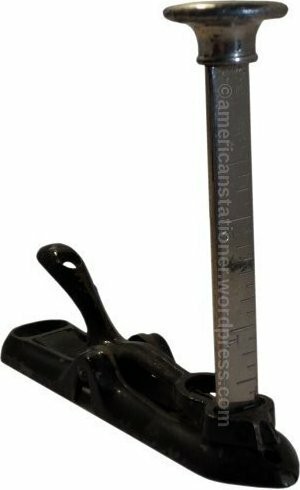 This holder was designed for the second part which was a steel single-stroke staple driver. It was a fairly simple device and straightforward to use. You would take the driver out of the clip, lift the plunger and insert a single staple into the slot. You would then take your papers to be fastened and clip them using the spring-loaded clip. The driver would be inserted back into the slot on the clip end and then you’d strike the plunger with as much force as you could muster to force the staple through the papers. When that was done you’d remove the papers from the clip, turn the stack over and manually bend the legs. Simple but it could be hard work. The clip portion of the fastener weighs 3 ounces and measures 4.5″ L x 1″ W x 1.438″ H. The driver portion weighs 2 ounces and measures 1.125″ L x 1.125″ W x 4″ H. Combined it weighs 5 ounces and measures 4.5″ L x 1.125″ W x 4.125″ H.
There are three U.S. patents referenced on the Novelty Fastener. These are patents 56884 granted on August 7, 1866, 226402 granted April 18, 1880, and 274941 granted April 3, 1883. The item patented under U.S. patent 274971 was also patented in England on April 14, 1880 under number 1535. The first two patents are referenced on the driver while the third is referenced on the clip. While I personally feel that their explanation for inclusion is something of a stretch, the U.S. Patent Office approved this and I would have to assume that they concurred with that statement. 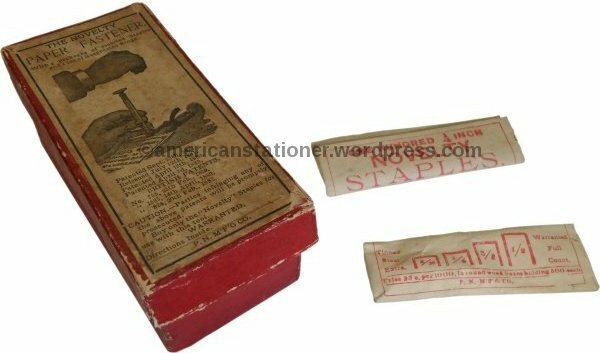 However, I would agree with the Early Office Museum in saying that patent 56884 should not be considered as the beginning of the desktop stapler since that item was designed for a much different purpose. 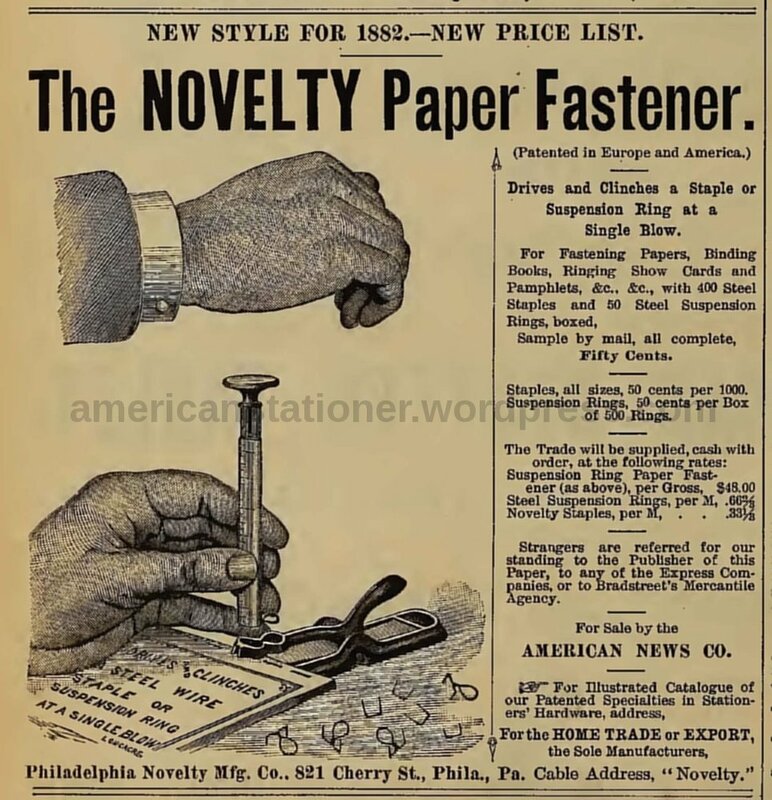 The Early Office Museum states that the Novelty Paper Fastener was advertised from 1880 to 1909. I have found ads starting in 1880 but only through 1896. The Early Office Museum is a reputable site so I’m confident that they have seen ads from 1897 through 1909. 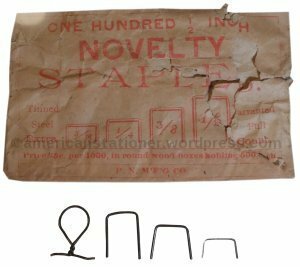 I have found references to the Novelty being sold as late as 1920 so the Novelty Paper Fastener seems to have been a very successful product. An advertisement from 1887 shows this being sold for 50 cents, a box of 1000 staples for 30 cents, and a box of 1000 suspension rings for 60 cents. I’m unsure of when manufacture ceased for the Novelty but I do know it was exported in large numbers which may partially explain its longevity as a product. As I noted in the beginning of this post, there is a lot of debate regarding early staplers. However, this debate goes all the way back to when this field was young. The pioneers of paper fasteners all ended up taking each other to court numerous times over patent arguments. Pioneers such as George McGill, Albertus Weeks and the Philadelphia Novelty Manufacturing Co. seemed to constantly be after one another. 1. The Heysinger patent, No. 226,402, for a stapling machine for filing and binding papers, must be limited, in view of the prior state of the art, to the specific structures described and claimed; and its claims covering a clinching base, a staple driver, and both in combination, are not infringed by an apparatus which lacks a part of each device either expressly incorporated in the claims, or described in the specifications as essential. 52 Fed. 816, affirmed. 2. Altering the slots of the guide clip of a stapling machine so as to permit the staple driver to be inserted both crosswise and lengthwise, or so as to give sufficient room to drive a staple with a projecting eye, does not involve invention. 52 Fed. 816, affirmed. 3. The Heysinger patent, No. 274,941, for a stapling machine, is void for want of invention. 52 Fed. 8l6, affirmed. Not the outcome they hoped for I’m sure, but it didn’t seem to affect them too much in terms of sales. Despite the fact that these were made a hundred plus years ago, they were made in such numbers and for such a long time that there are still a lot of them out there to be had. Couple this with the fact that they were made of iron/steel and consisted of about 6 parts in total and you have a combination that makes this item relatively easy to find in decent shape. A final general word of caution; old metal, especially cast iron, tends to get brittle with age. While, if you have one, the mechanics still likely operate, you shouldn’t actually try to use it to staple something. You might get away with it once or twice but the most probable outcome of your experimentation will be a broken heart when you snap your stapler into several pieces.